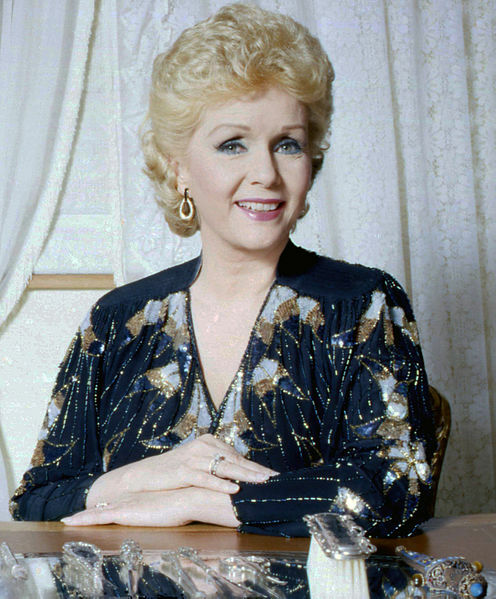 American octogenarian actress Debbie Reynolds, mother of actress and author Carrie Fisher, has died at the age of 84 on December 28, 2016 just 1 day after her daughter Carrie Fisher. Cause of death for Debbie Reynolds is suspected to be a stroke, although that has not been confirmed. 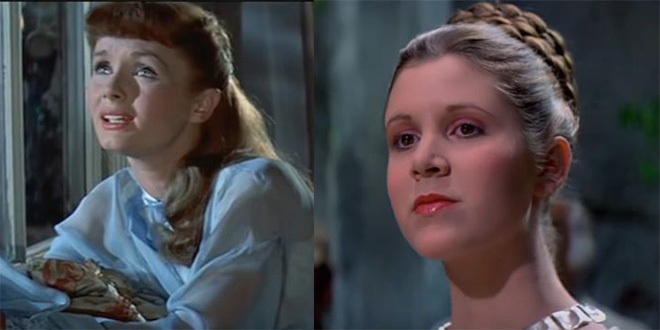 Below, a montage of mother Debbie Reynolds (on the left in Tammy and the Bachelor, 1957) & daughter Carrie Fisher (on the right in Star Wars, 1977) in their respective movie heydays. Born on October 21, 1956, seniors will recall Carrie Fisher as the oldest child of actress Debbie Reynolds and singer Eddie Fisher (d. 2010); her younger brother Todd Fisher was born in 1958. 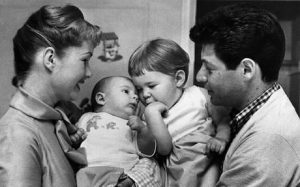 Right, married couple Debbie Reynolds & Eddie Fisher with their son Todd Fisher and daughter Carrie Fisher in 1958. (Photo: Pinterest). Carrie Fisher is remembered by seniors and baby boomers alike for her acting role as Princess Leia in the 1970's and early 1980's Star Wars movie franchise, and rom-coms like When Harry Met Sally (1989) and Shampoo (1975). 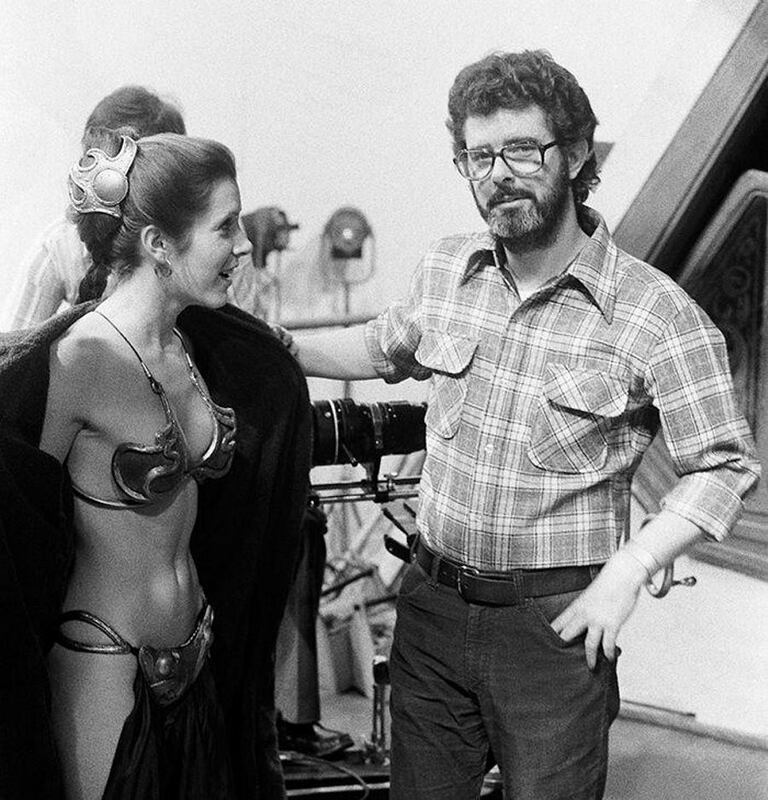 Below, Carrie Fisher in costume as Princess Leia with Star Wars creator, writer, and director George Lucas. According to her autobiography The Princess Diarist (2016), Carrie Fisher and her actor Harrison Ford had an affair while filming Star Wars (1977) Harrison Ford was Fisher's co-star and romantic interest on-screen in Star Wars. In the late 1980's, Carrie Fisher also began writing and published her semi-autobiographical novel Postcards from the Edge, which satirized her own late 1970's drug addiction and her relationship with her famous mother Debbie Reynolds. Fisher then wrote the screenplay for the box-office smash movie Postcards from the Edge (1990) starring Meryl Streep (as the fictionalized version of Carrie Fisher), Shirley MacLaine (as the fictionalized version of Debbie Reynolds, and actors Jack Nicholson and Dennis Quaid as their love interests. Between 1991-2005 Carrie Fisher worked on the screenplays of other writers, including on scripts for producer George Lucas. In more recent years, Fisher had done voice acting and reprised her character of Princess Leia in Star Wars Episode VII: The Force Awakens (2015). One of her longest relationships was with singer Paul Simon (1977-1983), a romance that was resumed after she broke her engagement with Canadian actor Dan Aykroyd (her co-star in The Blues Brothers (1980). Carrie Fisher and Paul Simon married in August 1983 and divorced 1984; even post-divorce, they dated again. Below, a video tribute to Carrie Fisher and Paul Simon. Carrie Fisher's only child, daughter Billie Lourd was born in July 1992; Billie's father is talent agent Bryan Lourd. Carrie Fisher's bi-polar disorder played into her acknowledged drug abuse (cocaine and prescription medications). She underwent ECT (electroconvulsive therapy) in the late 2000's to treat her bi-polar disease. 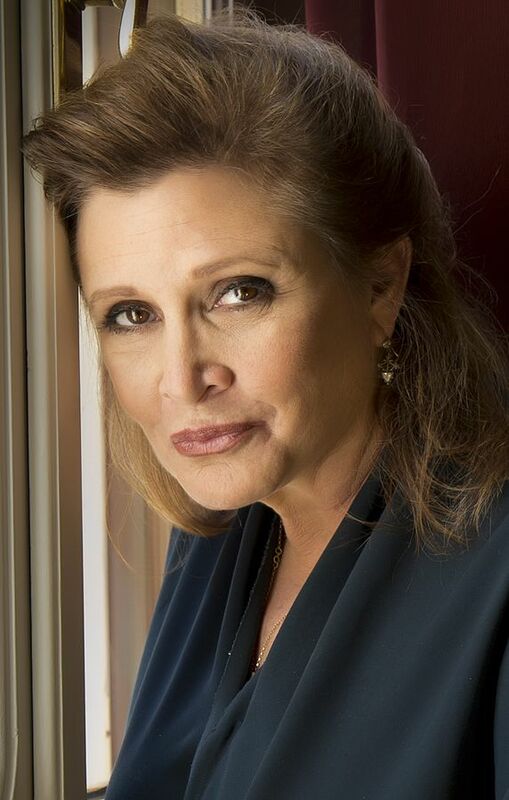 During a flight from London to Los Angeles Carrie Fisher went into cardiac arrest and died 4 days later, on December 27, 2016 at the age of 60. Stage, television and film singer and actress Debbie Reynolds (nee Mary Frances Reynolds) was born on April 1, 1932 in El Paso, Texas. Soon after winning the Miss Burbank beauty contest as a 16-year-old teenager, Warner Bros. signed her to a movie contract. Her best pals on the Warner Bros. lot included Elizabeth Taylor. The first big movie for Debbie Reynolds was the musical Singing' in the Rain (1952) with Gene Kelly, Donald O'Connor, and Cyd Charisse. 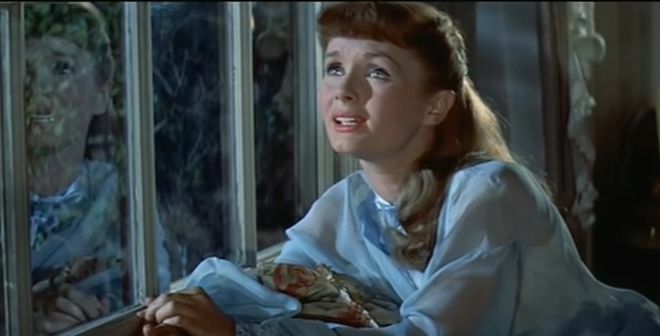 In 1955, Debbie Reynolds began what would become a 56-year involvement in the mental health charity The Thalians, only ending her involvement in 2011. Debbie Reynolds had also embarked upon another, much shorter involvement in 1955 - her marriage to singer Eddie Fisher. The innocent Debbie later said she was a virgin when she married Eddie Fisher. The couple co-starred in the musical comedy Bundle of Joy (1956), the same year daughter Carrie Fisher was born. Their marriage ended in divorce in 1959 when Eddie Fisher had a much-publicized affair with Debbie Reynold's recently widowed friend Elizabeth Taylor (Taylor's husband Mike Todd had died in a plane crash). Below, Debbie Reynolds gave her take on the affair that ended her marriage. The following year, Debbie Reynolds married businessman Harry Karl in 1960; they divorced in 1973. Her third and final marriage was to real estate developer Richard Hamlett in 1984; they divorced in 1996. Below, Harry Karl and Debbie Reynolds, as well as other stars/couples such as Russ Tamblyn & Millie Perkins, Walter Brennan, Karl Malden, Carroll Baker, Lee J. Cobb, James Stewart & wife, Rosalind Russell, and Irene Dunne, showed up at the premiere of How The West Was Won. Tammy and the Bachelor (1957) with Leslie Nielsen; she sang the title track song Tammy, which became a #1 hit single. The Unsinkable Molly Brown (1964) with Harve Presnell; Debbie Reynolds was nominated for an Academy Award for Best Actress for her performance in The Unsinkable Molly Brown. The Singing Nun (1966) with Ricardo Montalbán and a young Katharine Ross. How Sweet It Is! (1968) with James Garner. How the West was Won (1963), with a star-studded cast that included John Wayne, Henry Fonda, and Gregory Peck. Below, the movie trailer for How the West Was Won features Debbie Reynolds, Jimmy Stewart, Henry Fonda, and Richard Widmark. In her later years, Debbie Reynolds appeared in the feature film comedy In & Out (1997) with Kevin Kline, Wilford Brimley, Bob Newhart, Joan Cusack, and Tom Selleck (Magnum, P.I.). She played the character of Bobbi Adler (Grace's mother) on the sitcom Will & Grace from 1999-2006, earning an Emmy Award nomination along the way. Her daughter Carrie Fisher wrote the screenplay for the TV comedy These Old Broads (2001) which co-starred Debbie Reynolds, her old friend (they had reconciled years earlier) Elizabeth Taylor, Shirley MacLaine, and Joan Collins. Farewell, Debbie Reynolds and Carrie Fisher - you will be missed.